What’s with the title of this movie? Half nelson is a something most men are familiar with, possibly from their school yard years – a wrestling hold where you partly immobilize an opponent by constricting one arm and putting hand upon his neck. I guess the movie borrows this name as it refers to a feeling of both a total inability to release yourself, and the tantalizing sense that what holds you down cannot actually be stronger than you. 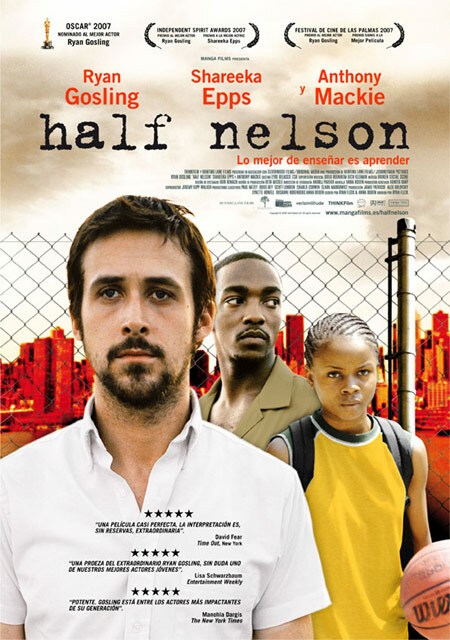 Half nelson is more of a smart, cheeky entanglement than a brute force. It allows you just a little leeway of space, challenging you to push just a bit harder, roll over with a bit more determination, scream a little bit louder… and you’ll be free. Ryan Gosling’s character in the film, Dan Dunne, looks like he’s been caught in a half nelson for the best part of his life. By his drug addiction. Dunne is a teacher in a predominantly black New York primary school. Disheveled, deprived of normal sleep, living a double life, he is, as Alicia Keys put it, in a “constant state of going nowhere”. An owner of a weak will and a good heart, he seems to awaken only in class, when he teaches history to his 13-year old students – energetically, in an almost inspired way, not instructing them but utilizing their own language and attitudes to challenge their interest. I couldn’t shake the feeling that Dunne does not go to the level of his subjects on purpose, as a smart educational approach. Rather, he is one of them. He is a child – very intelligent, but at the same time naive, playful, loving the display of bravado and attitude, and often lost. The main conflict of the movie pits Dunne versus one of his students – Drey (Shareeka Epps). She’s got issues of her own – a brother in prison for drug dealing, a family associate who constantly tries to seduce her in becoming his drug mule, a missing father and over-worked mother. As Drey becomes aware of Dunne’s drug problems and is drawn towards helping him (he is probably the most likable of teachers around), he sees in her the one chance to really help that “one person”, to really change the life of just one, to make his contribution to the world. Drey’s salvation is his own. He does not actually realize this – rather, he follows his blind, desperate instinct. And he really does not know how to go about saving her, oblivious to moral lines in their relationship and crossing them repeatedly. Dunne is such a sympathetic character because it’s very easy to identify with his lack of spine. We are all like him in some respect – we all go round and round in our own very personal and at the same time very universal vicious circles, we all alternate between keeping the faith one day and despairing on the next. Drug addiction is a very real problem (and a dramatic one, which works cinematically) – but it could be anything. Mine is not finding the strength to drag out the stories in my mind and bring them to life. Yours might be something very different, like accepting baldness or cutting down silly spending. It’s all very human. So kudos to the filmmakers for recognizing this and just letting the film BE, rather than forcing the film to TELL – it’s the toughest job in the business I reckon. In the end, it is suggested Dunne saves Drey by going to the extreme of being himself. The great part is that this is not presented as a conscious choice of his. He simply disintegrates to the point of inspiring a change, if such a process could even exist. It’s maybe just a coincidence, fate, or an example of the beauty of life even in the most fucked-up situations.